Since 1993 we have provided excellent service across the Eastern United States with their sheep fencing needs. Whether it’s sheep fencing, llamas, horses, cattle, deer, bison, or alpacas, we have held ourselves to the highest standards possible in quality sheep fencing and sheep fence installation. We offer a free Sheep Fence Consultation on the type of sheep fence that works best within your needs and budget. Sheep fence installation is a crucial decision for protecting your livestock from getting out or any predators getting in. Whatever questions you have about sheep fencing and the sheep fence installation process, we are here to help with gratitude. When trying to make the right decision about which type of sheep fence to install it feels overwhelming when so many factors come into play. Let us do your thinking for you. First thing to know is that sheep fencing requires perimeter and interior fencing. High quality materials are needed for the perimeter sheep fence to keep out predators. The best choices for perimeter fences are multi-strand, high tensile, electric fences, and woven wire fences with electric offset wires and barbed wires at the top and bottom of the fence. We highly recommend the woven wire sheep fencing for its strength and economical benefits. 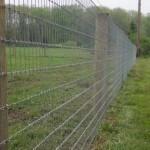 It is the most popular model for sheep fencing. If you have any questions, then give us a call for a free sheep fence consultation and we’ll answer all your questions with the utmost accuracy our decades of service has accumulated. Contact us today for a Free Sheep Fence Consultation. From our free Sheep Fence Consultation to the sheep fence installation, we are here for you every step of the way. The ease of the sheep fence installation and durability of our fences is a trademark of our family owned company. We have been performing sheep fence installations for properties large and small for decades. We have installed fencing on all types of terrain and around many obstacles. Since all fencing situations are different for all properties, we suggest contacting us for a free Sheep Fence Consultation whether or not you are considering us for your sheep fence installation.